This table offers great value for money. With its system for adjusting the net and its ball storage compartment, the SPORT SPORT 250 INDOOR is a match for superior tables. This table offers great comfort for users due to its optimized COMPACT TECHNOLOGY storage system. The SPORT 250 INDOOR is approved by the FFTT (French Table Tennis Association) for leisure use and is perfect for your family tournaments. Large diameter caster wheels, with brakes. Excellent mobility. Large feet made of resin with adjustable footpads for leveling table. Storage bins placed on both sides of the table to store balls. Product designed, developed and manufactured in France. A system for adjusting the tension and height is provided on the net posts. Our Price on tables include shipping to many locations. Shipping to some locations may require an additional fee. If so, we will contact you before we process your order so that you may approve the additional fee. Note that freight shipping is expensive; therefore, when comparison shopping, be sure to check whether shipping is included. 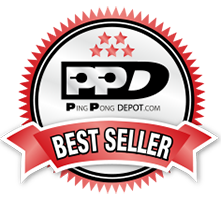 We guarantee that we have the best Price of any table tennis retailer. We guarantee that we have the best Price in the U.S. or Canada, and we will match our competitors’ specials! If you find a regularly priced product from an online retailer, to be cheaper prior to your purchase, we will not only match their price, but also take an additional 10% off the difference in price.